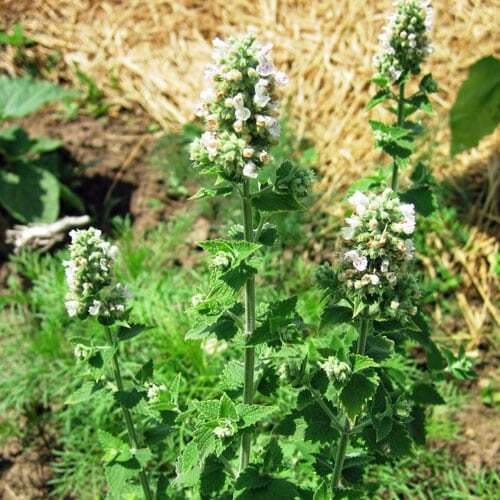 Today's featured plant is Catnip, Nepeta cataria. Catnip is also known as catnip, catnep, catmint, catrup, catswort. Although native to Asia and likely brought over from Europe, catnip is now naturalized in much of the world. It can be found throughout the United States and Canada (see map). It can grow in wide variety of soils, in sun or shade, in dry conditions. Like many weeds, it pops up in fields, gardens, along roadsides, and in public parks. I noticed some lovely clumps of it outside near the museum last week. The flowers are white with a slight hint of purple, and are tubular in shape. They grow in clusters near the top of the plant. The plant is a perennial, so it will come back year after year. If you don't want it to spread too quickly, make sure to deadhead before the flowers set seed. The nectar of the flowers attracts long-tongued bees primarily, including honeybees, bumblebees, cuckoo bees (Epeolus spp., Triepeolus spp. ), digger bees (Melissodes spp. ), and leaf-cutting bees (Megachile spp.). Other visitors that occasionally visit the flowers include Halictid bees, wasps, flies, butterflies, and skippers. The foliage is one of the food sources for the caterpillars of such moths as Sphinx eremitus (Hermit Sphinx) and the polyphagous Xanthotype urticaria (False Crocus Geometer). A Eurasia aphid that is rarely observed in North America, Aphis nepetae, also feeds on Catnip. The pungent foliage is shunned by mammalian herbivores as a food source. One animal that is strongly attracted to Catnip, however, is the domesticated house cat. Apparently, a chemical in the foliage produces a pleasant intoxicating effect in cats, somewhat akin to the effect of marijuana on humans. As a result, plants in residential areas may display signs of damage from cats rolling in the foliage. Yes – catnip is like kitty marijuana. Wildflowers of Wisconsin says this effect applies from lions and cougars to domestic cats, so if you've got large wild cats in the area, you may want to be cautious with your catnip plantings. I know my kitties love it. As a special treat, we make catnip “socksicles” for the kitties to have inside. We used to give them loose catnip, fresh or dried, but it made big mess. Now, we take old socks (for instance, with damaged elastic) and stuff them with fresh or dried catnip. Ta-da! The Socksicle! 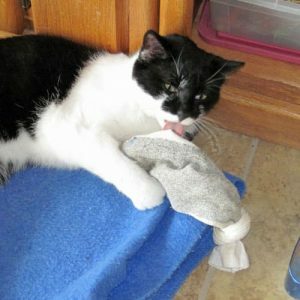 Zorro loves to wrestle with and lick his socksicle. Don't mess with my catnip! You'll note the the above description indicates that wild mammals don't eat catnip (although many birds, such as finches, will eat the seeds). I use this to my advantage to protect my seedlings from wild bunnies. 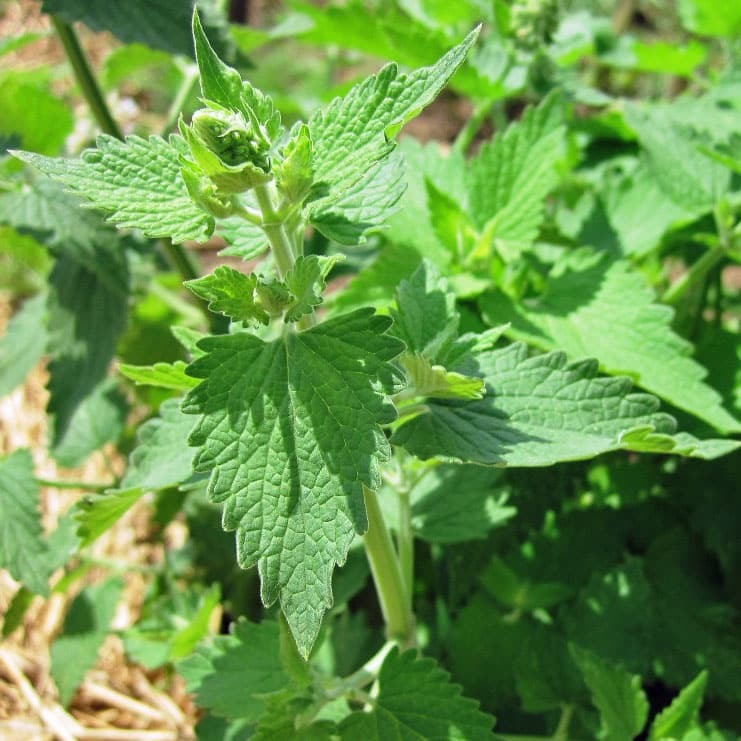 Catnip oil also contains a compound that lab tests have shown to be stronger than DEET for deterring mosquitoes. 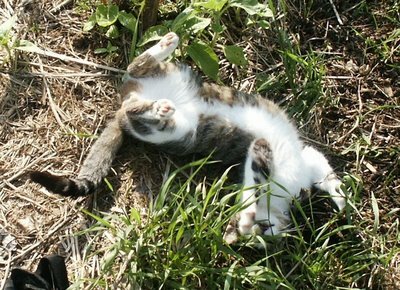 When I'm out in the garden and the mosquitoes are moving in, I grab a handful of catnip and rub it all over myself. It helps significantly. If I'm a little slow and get bit up before I get it on, I use plantain to soothe the bites. Catnip has a long history of use in alternative medicine, being employed especially in treating disorders of the digestive system and, as it stimulates sweating, it is useful in reducing fevers. The fresh juice is used as an emmenagogue (to promote menstruation). Mild catnip tea is used to relieve colic in babies, restlessness and nervousness, and is very useful as a mild nervine for children. Stronger tea relieves fevers due to colds and flu as well as calming the stomach and preventing nausea and diarrhea. The fresh young shoots are good in spring salads and rubbed into meat for flavor. Applied externally or added to bath it is good for skin irritations. Catnip oil is great for aroma therapy. A strong infusion can be used to repel fleas from carpets or the fur of animals. An extract from the leaves (called nepetalactone) has herbicidal and insect repellant properties. To make catnip tea, steep two teaspoons of dried leaves in a cup of boiling water for 10 minutes. Cover cup while brewing to contain volatile oils. Strain and serve. In the video below you can get a better look at one of our catnip plants, with some help in identification from our cats, Ronnie and Miss Kitty. As always, any medical information is for informational purposes only. Always exercise caution when using any wild plants. I have catnip growing and the funny thing is that the house cats are affected by it but the strays seem indifferent to the effects. I love the flowers! Thanks for hosting this week! I am sharing a recipe for homemade “jello”. Its super easy, good for you and kids LOVE it!! Linnae – thanks for linking up and linking back! “Drinking catnip tea is known to have many benefits. Catnip tea is known to contain a chemical called nepetalctone which promotes relaxation and sleep. Catnip tea is also known to alleviate pain caused due to menstrual cramping. Also strong catnip tea can help in reducing pain caused due to migraine headaches. Catnip tea can also help in easing the symptoms of flu like fever and sore throat. You can also use strong catnip tea for nasal decongestion. Catnip tea can also help in reducing the symptoms of diarrhea. I SO enjoy these posts! Thank you for providing them and including wonderful photos. I think I’m going to go out and find some catnip today to plant in our garden. Kathleen – thanks, I’m glad you like them. Once this plant is established, it’s been very easy to grow for me. If you can’t find the seeds (or plants) locally, they do sell them at Mountain Rose Herbs, along with the dried plant material. It’s funny when they get into it, too. They go from super excited to super relaxed in a matter of minutes. 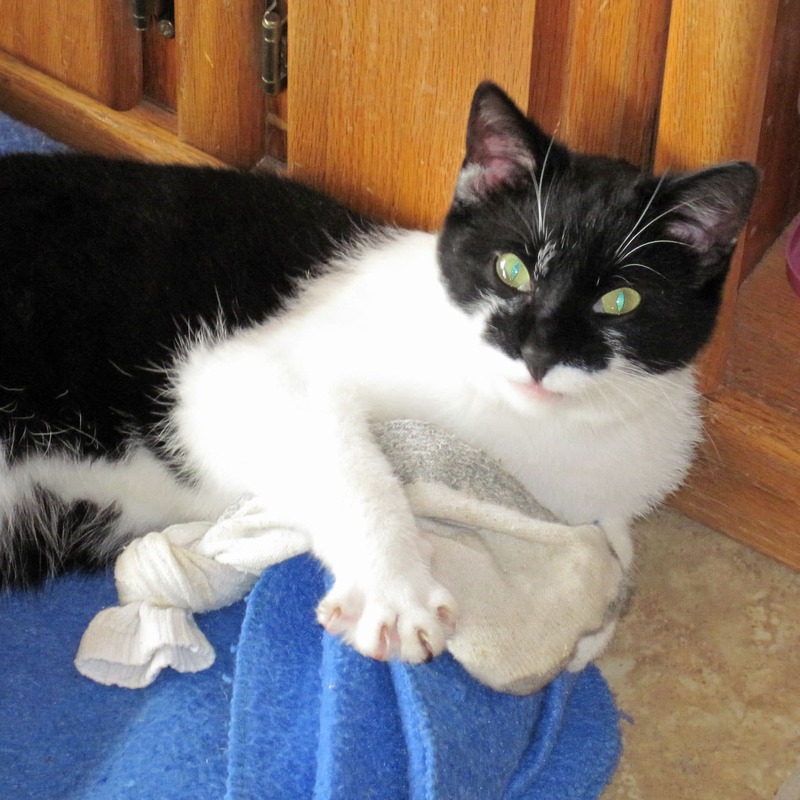 So glad I seen your post this morning… I just bought some catnip to grow for my kitties. I didnt realize all the great things you can do with catnip. I looked at your map and it shows Florida as the ONLY state it doesn’t grow in ?! Can you verify that? Thanks! The map is from the USDA, so they probably have better resources than I do< but I'm sure you could grow it from seed even if it doesn't show up wild.